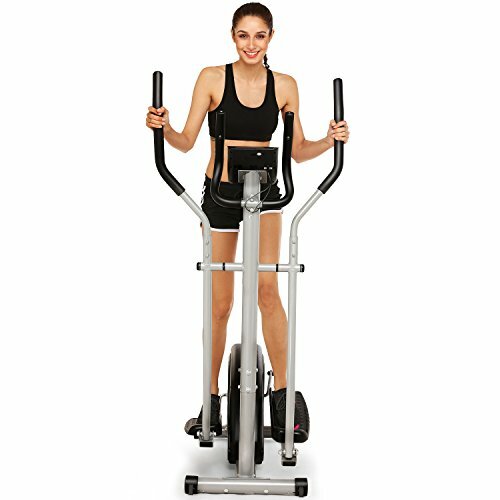 ?Adjustable Resistance?- 8 levels of magnetic resistance, you can use convenient tension knob to adjust exercise intensity. With simple turns, you can increase or decrease resistance so that your workout is always challenging and effective throughout the entire fitness process. ?Digital Monitor Display & Heart Pulse?- LCD Digital Monitor Show Your Time, Speed, Distance, Calories Burned, Pulse Rate, Scan. Pulse Pads on the Additional Stationary Handle Bars Provide Heart Rate Monitoring. ?Heavy-Duty & Big Non-slip Pedal?- Increase the strength of the frame which can support a maximum of 250lbs. 13 inch non-slip pedal provides a no impact, smooth flowing workout, increase stability and comfort. ?Smooth & Quiet Driven?- The precision balanced flywheel and V- belt drive provide a smooth and quiet operation. You can enjoy the convenience of working out without leaving the comfort of home that offers all of the necessities for an amazing cardio workout. ?Portable and Easy to Move?- Wheels at the front of the unit allows the user to move their bike around with ease, from room to room, or store it away out of sight. Provides a no impact, smooth flowing workout for your upper and lower body. Perfect for a user who wants all the benefits from running, but is safer on the knees and incorporates more upper body movement for a total body workout.